James Ambrose Cutting (1814–1867) is most noted as an American photographer and inventor, credited with developing the ambrotype photographic process. 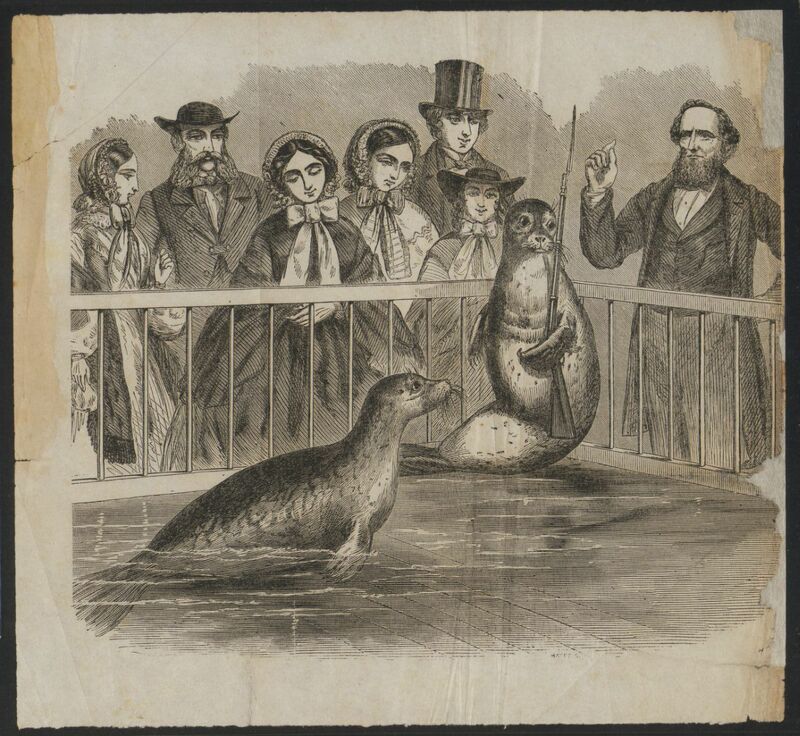 However, he was also keenly interested in marine life, and eventually used the wealth he accumulated from his various inventions to establish an aquarium in Boston in 1859. It was the first independent aquarium exclusively for the appreciation of marine life and the education of the public . While he was committed to the scientific and scholarly mission of the aquarium, he also viewed exhibitions and entertainment as perfectly suitable vehicles for educating the public. 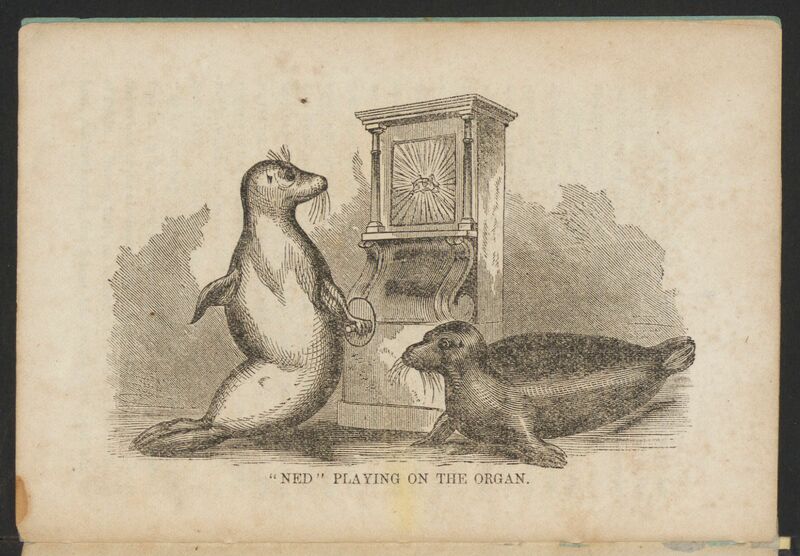 One of his most successful and popular exhibition was his “Learned Seals”, “Ned” and “Fanny”. Cutting personally trained these seals, captured as young pups, and featured them in several performances. This extremely rare pamphlet, published in 1860, describes the fascinating duo and what tricks they could perform. The pair of Seals now domesticated at the Aquarial Gardens, Boston, have attracted so much attention and remark by their pleasing and wonderful performances, that we shall gratify not only those who have visited the Gardens, but the public generally, by giving a brief history of the curious and intelligent animals. The pair, named by the proprietors of the Aquarial Gardens, ” Ned” and “Fanny,” are of the common species so well known upon our coast. As the visitor to the Aquarial Gardens will have observed, there is equal intelligence in their eyes, and the same ready appreciation of Mr. Cutting’s commands, though their performances are different both in kind and extent. One of “Fanny’s” performances amuses every one who sees it. 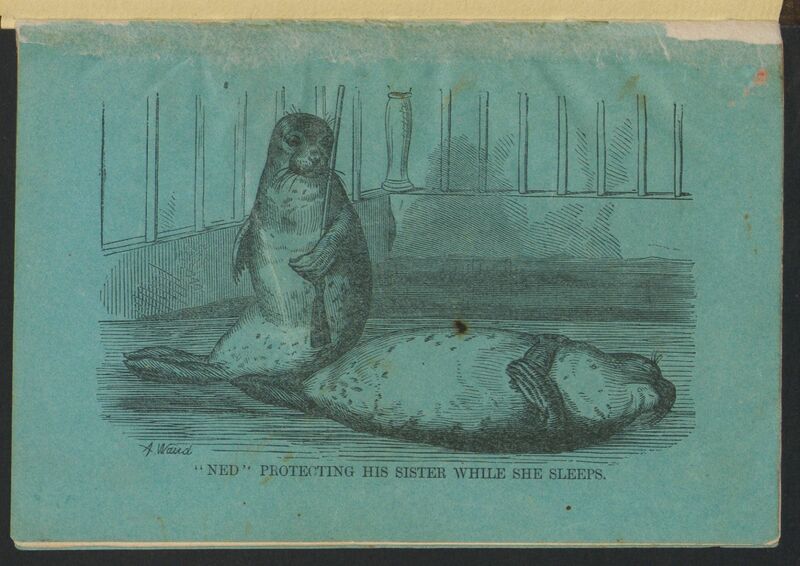 She will lie upon her back, meekly fold her hands —meaning, of course, her flippers—upon her bosom, and will feign sleep and snore with the energy of the most inveterate night-trumpeter in the human family….Mr. Cutting having handed him a rifle or gun, “Ned” shoulders arms instanter, and with all the gravity of a member of the Governor’s body guard, or the comicality of a Massachusetts farmer on training day. But passing over his other performances, we may mention one other, and that one most marvelous. We refer to his playing upon the hand organ, which he has learned to do with perfect ease and wonderful adroitness, even to the changing of hands when one of them is wearied with the exercise. Sometime in the mid 1860s, Cutting sold the Aquarial Gardens to P.T. Barnum. While the circumstances for his decision to sell is unknown, it is assumed that it was due to personal financial woes. He loathed the transformation of his beloved aquarium into a crude side show amusement hall, perhaps contributing to his eventual mental collapse. Sadly, Cutting died in an insane asylum in Worcester, MA, 1867. 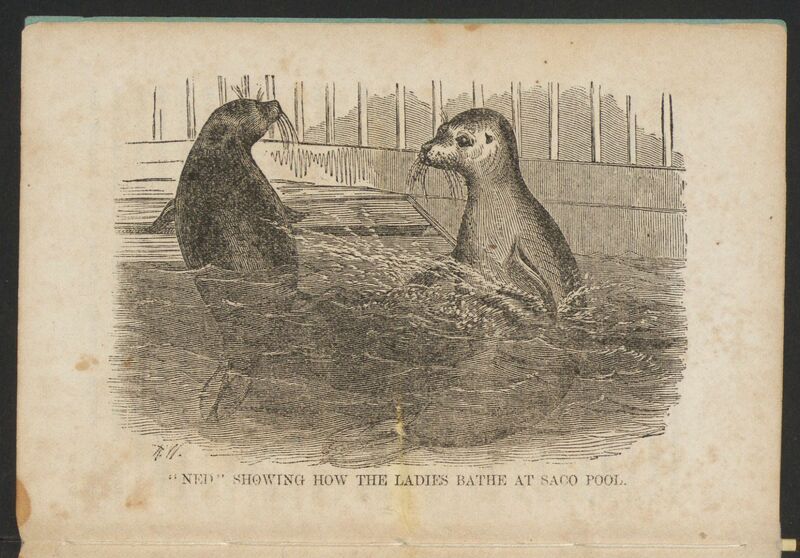 The Domestic history of the learned seals, “Ned” and “Fanny” :at the Boston Aquarial Gardens, 21 Bromfield Street. New York : G.A. Whitehorne, Printer, 1860.